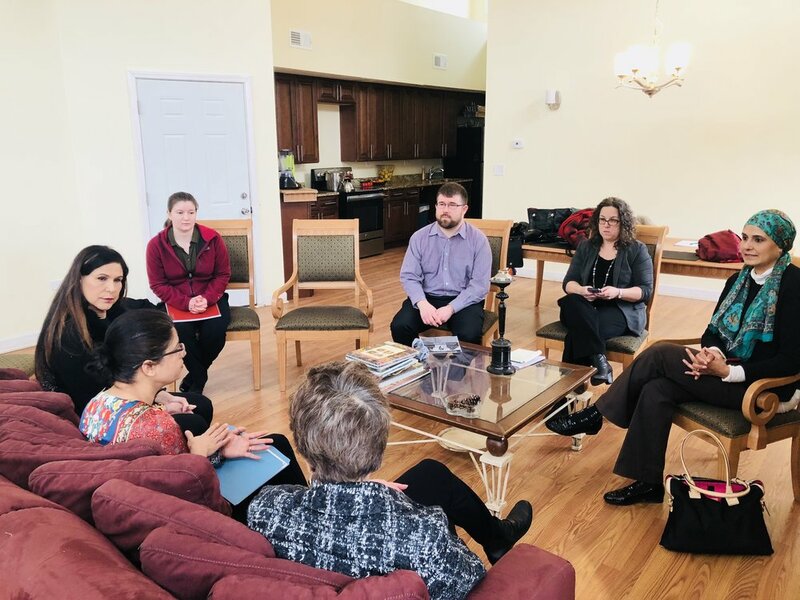 Today Suzy’s Place hosted Congresswoman Jan Schakowsky, who is our powerful voice in Washington D.C. Members of her staff also attended. Thank you Dr. Dilara Sayeed with the IL Muslim Civic Coalition for bringing the Congresswoman to us. We talked about challenges shelters face and what action needs to be taken to provide better resources. Suzy’s Place Resume and Interviewing Skills Workshop hosted by Farvah Lakhani has been moved to Saturday, December 8th, 2018 from 12:00pm to 1:30pm. Thank you everyone for participating in Suzy’s Place 2nd annual Turkey Drive. Because of you there are so many smiles on so many faces. Thank you Mayor Riley for the opportunity to serve your community. 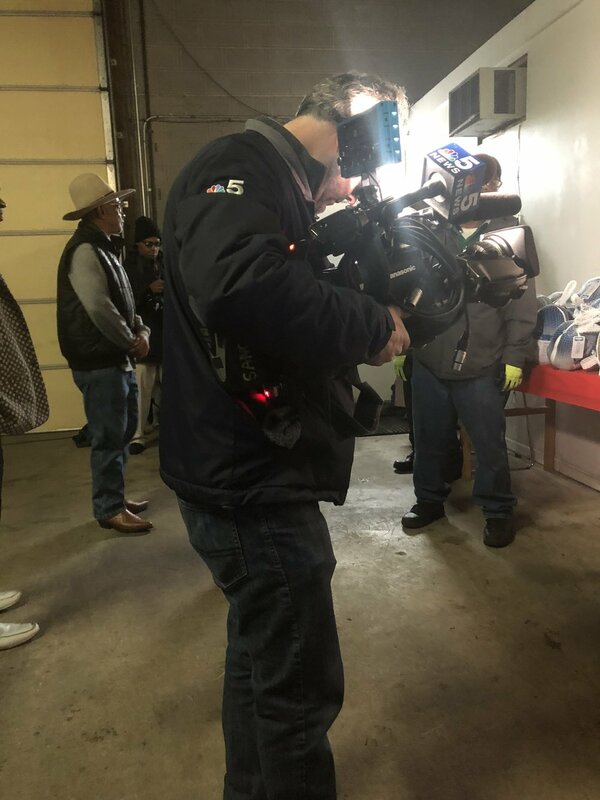 Thanks also to NBC 5 News for covering the event. Have a blessed Thanksgiving! A domestic violence dispute turns horribly tragic Monday afternoon at Mercy Hospital in Chicago, Illinois. Let’s all pledge to work towards building a safer environment. A great afternoon of community service. Today’s free community health consultation and workshop was a huge success. 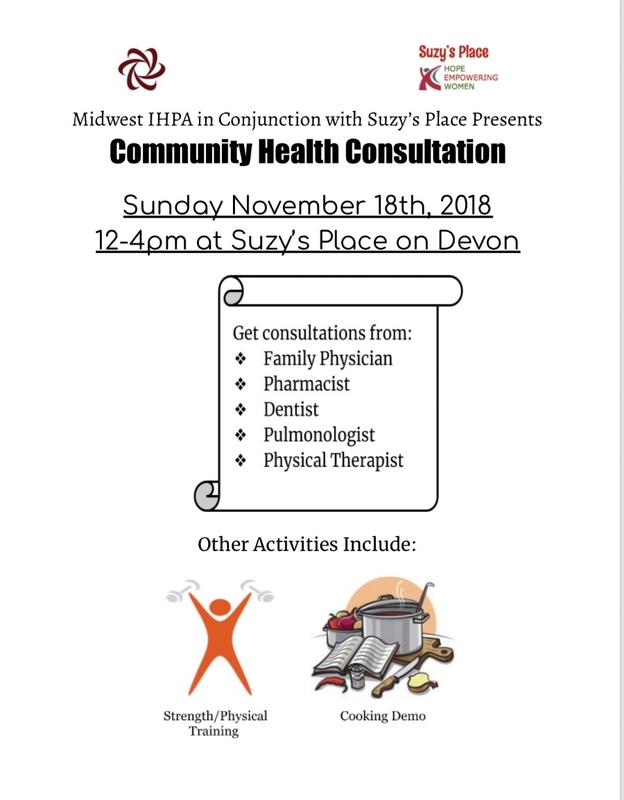 Suzy’s Place partnered with Midwest IHPA by bringing health professionals ranging from cardiologists, pulmonologists, family physicians, nutritionists, dentists, physical therapists, and nurse practitioners to serve the Rogers Park community. The honorable Indian Consul General, Nita Bhushan came and talked to our volunteers about their commitment to serve. Officer Mayra Gomez from the Chicago Police Department also came for outreach. A big turn out kept everyone busy all afternoon. Thank you David Loundy and the Loundy Charitable Foundation from Devon Bank for your generous donation towards Suzy’s Place. Together we serve our Rogers Park community in bringing about a positive social change. Click on the 2018 Thanksgiving tab located on the top right corner to donate. Smartphone and Tablet users click on the menu icon located at the top right of the screen to access the page. We had so much fun hosting daily dinner/iftar service at Suzy's Place. We could not have done this without the support of all our volunteers and donors. Thank you to each and every one of you! 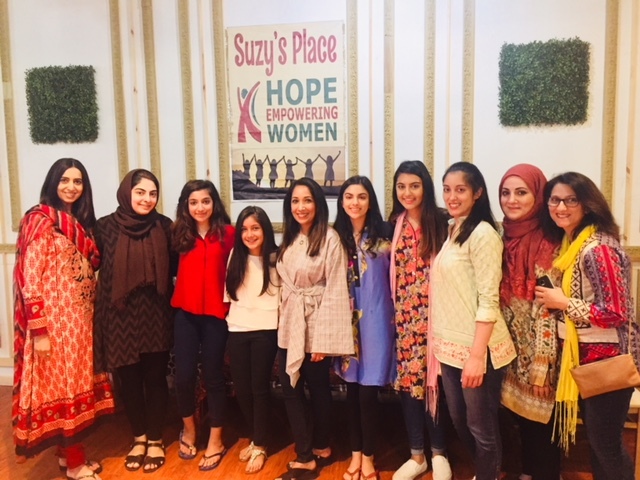 Thank you to the South Asian Students Association of Lake Forest College for volunteering their services to Suzy’s Place. They made 100 care packages, each one personalized with empowering text, for the women we help. Today their President Maham Mansoor came and delivered the packages to our office. 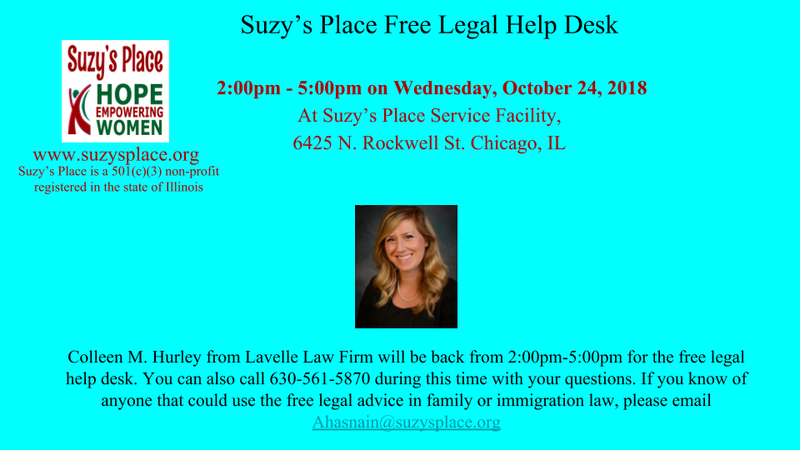 We thank your entire team for all their hard work and commitment to Suzy’s Place in making a better and safer Chicago. Happy New Year from all of us at Suzy's Place! Let's work together to make Chicago a better and safer place for everyone. 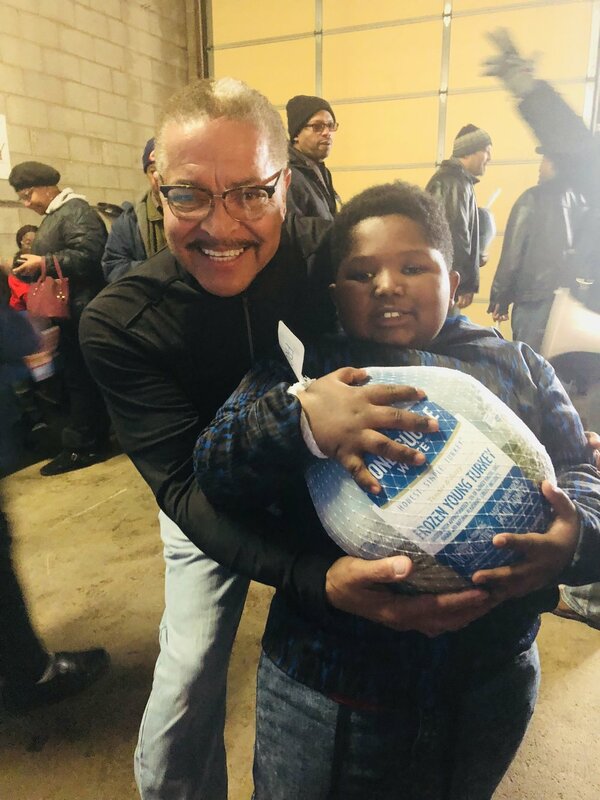 Suzy's Place was happy to work with the cities of Chicago, Dolton, Maywood, Robbins, and Phoenix, IL in distributing Thanksgiving turkeys to 2000 households. Thank you to everyone who donated this holiday season. Look forward to everyone attending. We need your help and support. It should be an exciting evening to help empower women of domestic violence. Welcome to Naz Shah, President of Nu Image Aesthetics and Wellness Institute, as our newest addition to our Board of Directors. Your passion, dedication, and commitment to Suzy's Place is highly commendable. We look forward to working together and making an impact in our Chicagoland community. Look forward to seeing everyone at our Winter Gala on December 2nd 2017. Please save the date and reserve your tickets with us by calling the numbers on the card below. We will update you as we finalize our Keynote Speaker and the rest of the program. Please join us and help the survivors of domestic violence. Collective community building project to raise money to distribute turkeys across the Chicagoland area to needy families for Thanksgiving. You can click on the "TURKEY DONATION DRIVE" button below to donate. What an exciting event last night was! Thank you everyone for joining us and supporting Suzy's Place. The elected officials were so generous with their time and wise words of support. A big shoutout to Congressman Raja Krishnamoorthi, Secretary of State Jesse White, and Alderman Carrie Austin for their energy and positive thoughts about the work Suzy's Place is doing to support women and children of domestic violence in Chicago. We need everyone's help now more than ever! Please donate! Thank you. Excited to announce that the Secretary of State Jesse White, Congressman Raja Krishnamoorthi, Congresswoman Jan Schakowsky, and Alderman Carrie Austin are all confirmed to attend the Inauguration of Suzy's Place on Friday, September 8th, 2017. We would like to give a loud shoutout to the Naperville and Evanston community for helping us donate an entire truckload of items for Suzy's Place. Not only did we collect around 500 pairs of shoes, we were also able to get miscellaneous furniture and kitchen items for our shelter. Thank you for your generosity! We want to let you know the drop-off locations for our shoe and clothing drive. We are starting two new campaigns to positively impact the lives of women and children in Chicago, particularly survivors of domestic violence. Our two campaigns are to collect 1000 pairs of shoes that are new or gently used and to collect women's work clothing that will help the ladies in our shelter during their job interviews. Thank you to all our volunteers and supporters for your help in serving daily iftar/dinner to everyone during the month of Ramadan. Today is the 29th and final day of our daily iftar/dinner open to all. This was made possible because of you! 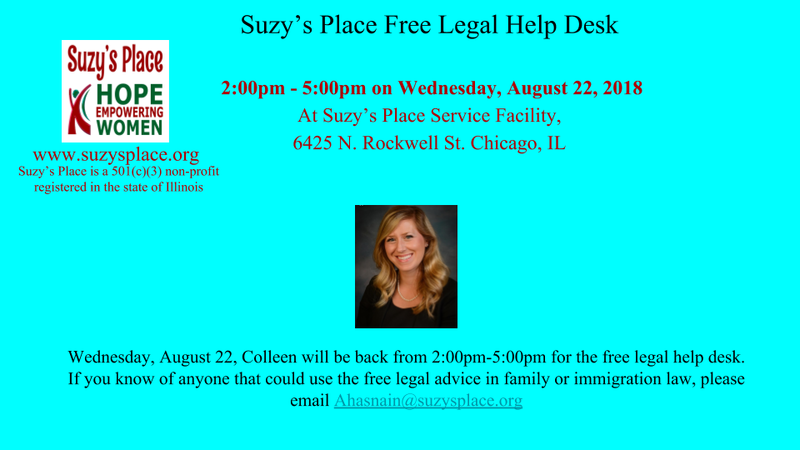 Please continue to help Suzy's Place to empower women and children in the Rogers Park neighborhood of Chicago. Your energy and time make everything possible. Today is day 9 of our daily food service to the women and children in Rogers Park. We see many families with young children who look forward to a nutritious meal. Thank you to all our volunteers and supporters that continue to make each night a success. We have another 20 days to go before the end of Ramadan, so please continue to help those in need of a healthy meal. Visit us on Facebook, https://www.facebook.com/Suzys-Place-232412787223842/, to see our daily updates. As Ramadan approaches Suzy's Place will be hosting daily Iftar/dinner for needy women and children in the Rogers Park area. While this coincides with Iftar it is open to all comers regardless of religion. We would like to reach out to our extended community and see how you all can take part in this community serving/giving program. Daily Iftar/dinner will cost us $8.00 per person from Friday May 26th - June 25th. We expect close to 100-120 women daily. Please let me know which day you would like to host an Iftar/dinner. Message Arshia Hasnain at ahasnain@suzysplace.org and I will get in touch with you personally. Give generously and feed those that are less fortunate. Thank you! Thank you to everyone who came to the Suzy's Place event with Ustad Rahet Fateh Ali Khan at the Hyatt Rosemont Wednesday night. A special thank you to our guest of honor, Ustad Rahet Fateh Ali Khan. He spoke so eloquently and passionately about Suzy's Place and backed it up with a VERY generous donation. He is a supporter! Thank you Rahet sahib. Also a big shout out to Monty Sayed for bringing Rahet to the event! Suzy's Place looks forward to hosting the legendary Ustad Rahet Fateh Ali Khan, who will talk about the importance of the work of Suzy's Place. There will also be a fun fashion show presented by Studio Elite. The event will be on Wednesday April 26, 2017 at the Hyatt Rosemont, 6350 N. River Rd. Rosemont, IL 60018, at 7:30pm. 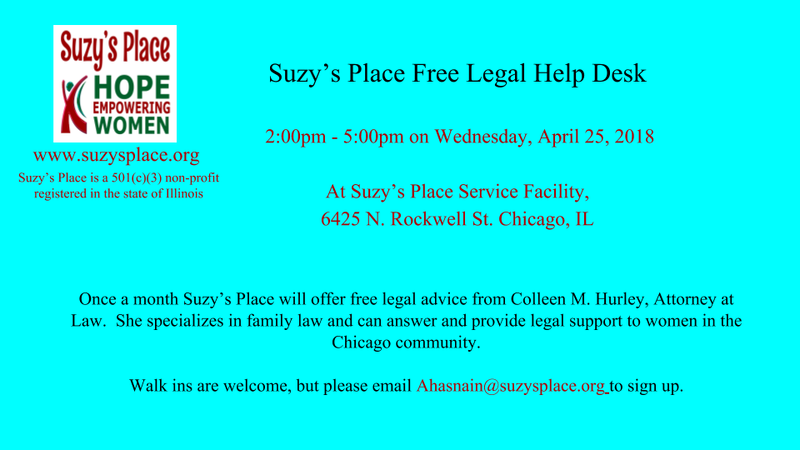 For more details please email ahasnain@suzysplace.org. 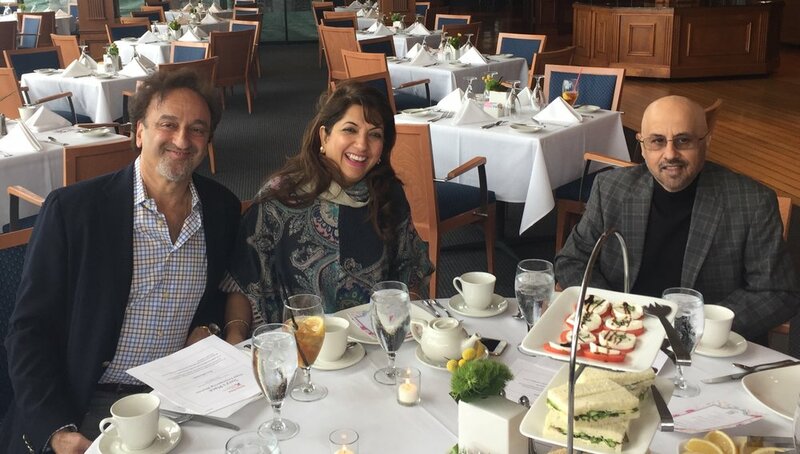 Suzy's Place held a private high-tea community awareness event at the Chicago Yacht Club on Sunday, March 26th 2017. The afternoon was graced by the presence of the Honorable Neeta Bhushan, the Consul General of India in Chicago. It was an enjoyable afternoon with lots of enthusiasm and warm support for Suzy's Place. Thank you! Click on the photo below to activate the slideshow. Suzy's Place is thrilled to announce our partnership with Devon Bank (www.DevonBank.com), a highly regarded bank in Chicago with a very strong community presence. They are helping us in many ways and we are deeply appreciative of their support. Thank you Devon Bank! Every 9 seconds a woman is assaulted or beaten in the U.S. The mission of Suzy's Place is to assist women who are victims of domestic violence including emotional, economic, sexual, and physical abuse. We provide emergency and transitional housing, emotional support, and a diversified continuum of services focused on safety, empowerment, and self-sufficiency. Through community partnerships, Suzy's Place raises awareness, provides services, and educates community members about domestic violence. Ready to take the next step? Become a contributor to our cause and participate yourself. The purpose of all abuse is to control the victim's behavior by the inducement of fear, and contributes to the abusers power and control over the victim. DOMESTIC VIOLENCE IS ... A CRIME!